This article was published in the August 2017 edition of NTEA News. Organized by Heavy Vehicle Industry Australia (HVIA) since its inception in 1968, the Brisbane Truck Show is the Australian transport industry’s premier event. Held every two years, it attracts more than 300 exhibitors and up to 40,000 attendees over the four days of entry. This year, about 56 percent of its visitors came from outside of Brisbane (14.5 percent of that total were international guests). Interestingly, HVIA commissioned a report to conduct an Economic Impact Assessment of the last show in 2015. Results concluded the event contributed the equivalent of 269 full-time employment positions (or $18.7 million in paid wages and salaries) and added more than $70.1 million dollars in output into the state economy. Although it’s a relatively small market of around 600,000 Class 3–8 units, Australia has an interesting mix of European, American and Asian truck products. Together with New Zealand, it’s unique in the global sphere, which made for an interesting truck show. Iveco builds this ACCO just for the Australian market. Iveco is part of the industrial arm of Fiat’s global automotive empire. It has a long history in Australia as Iveco bought American truck manufacturer International Harvester, which has had a manufacturing facility in the country for around 100 years. Its products reflect an ideal cultural mix, with European offerings through the Daily van (including a 4x4) and Class 3–7 EUROCARGO rigid; and the Stralis cab-over and PowerStar bonneted tractor unit, both unique to Australia. Last year, Iveco Trucks Australia was appointed exclusive distributor of International Trucks in the Australian market. At the show, its booth featured three new ProStar models in day, sleeper and extended cab versions. ACCO — the country’s most popular vocational truck model which is manufactured at Iveco’s Dandenong, Victoria, facility using 85 percent Australian-sourced components — was also displayed. 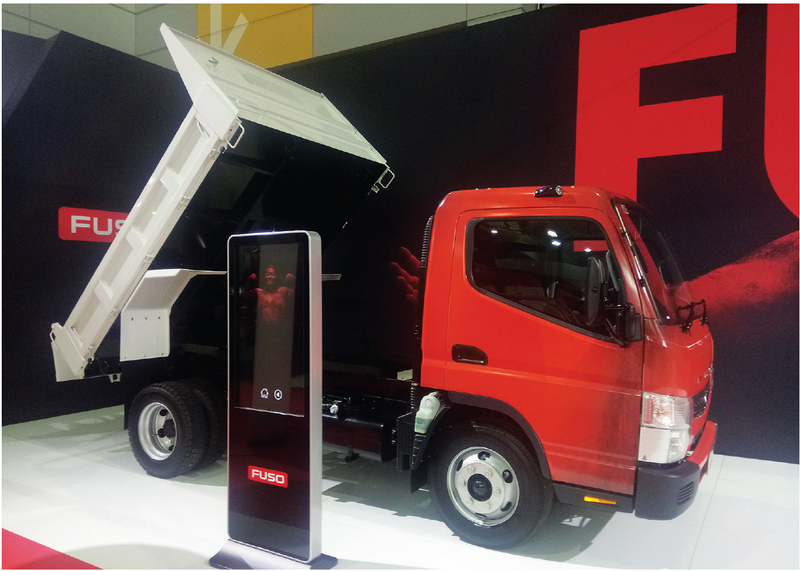 Isuzu’s exhibit would have been familiar to U.S. work truck industry professionals, but some new products were displayed, including an NNR 45-150 AMT box body (Vanpack) and NLR 55-150 Tri-Tipper. These are part of the Ready-to-Work range where Isuzu supplies complete vehicles for higher volume sectors. The NLR 55-150 featured a tipper body that can tilt to the left, right or rear. There was also an NPS 75-155 4x4 crew cab. Moving up the range, F-Series models included a 23,500-pound gross vehicle weight (GVW) FRR 107-210 tipper with TC-AMT transmission; long-wheelbase FSR with 26,000-pound GVW rated at 140 brake horsepower with automated gearbox; and FYJ2000 8x4 cement mixer fitted with a 370 brake horsepower engine for a 66,000-pound GVW. Isuzu’s heavy trucks were represented by the 120,000-pound GVW Giga CXY 455 6x4 tipper powered by a 450 brake horsepower engine. Daimler Trucks has three brand offerings in Australia — Mercedes-Benz, Fuso and Freightliner. The new Mercedes Actros was voted Best Heavy Duty Truck 2017 at Brisbane Truck Show. The company’s booth featured an Arocs 3243 with a 70,000-pound GVW and 430 brake horsepower rigid as well as an Actros 2530 6x4 rated 55,000 pounds GVW with a 300 brake horsepower engine. A typical Fuso Canter with manufacturer-supplied tipper body. Fuso didn’t launch any new products and had a normal array of familiar rigids based on the Canter, along with a heavy-duty FP54 Prime Mover. Canters at the booth reflected the complete vehicle lineup, featuring tippers with five-year warranties. Freightliner displayed a Coronado 122 stock-hauling special, which can pull up to 140 tonnes, and an Argosy cab-over featuring a 110-inch sleeper with the recently introduced Cummins X15 engine. Work trucks were represented by a Columbia CL112 8x4 day cab with a light tare weight and the popular Coronado 114 tipper developed for the Australian market. Hino held its global launch of the 300 Series 4x4, specifically designed for the Australian market. Hino Australia gave a sneak preview of its new 300 Series 4x4, the first time it was displayed globally. It also debuted the 500 Series wide cab with three models based on work truck chassis. Scania, part of the new Volkswagen-based Heavy Truck Group, offered the Australian truck-buying public a preview of its latest-generation S-series launched in Europe and voted 2017 International Truck of the Year. The booth also featured a trio of current-range PGR trucks finished in sparkling silver, with an R730 6x4 boasting the highest torque (2,585 foot-pounds) available in Australia, a G480 6x4 and a P310 8x2 rigid with GTB curtainside body. UD Trucks launched its new generation of flagship Quon 6x4 trucks with a 57,000-pound GVW. Quon premiered globally in Japan in April 2017, so this display signified the importance of the Australian market to UD Trucks. Volvo showcased its performance-based products with FH 700, and displayed an FM unit with a crawler gearbox. The company also had a demo unit of the dual-clutch system available in Europe. Mack Trucks brought two examples of its Australian-designed Super-Liner 6x4 truck featuring the M10 engine rated at 685 brake horsepower. DAF Trucks launched a new three-axle LF55 model. DAF Trucks, the European arm of PACCAR, displayed its CF85 510 brake horsepower tractor unit weighing just 18,000 pounds GVW. It previewed the Australian-designed LF55 50,000-pound GVW 6x2 rigid with mid-lift pusher axle powered by a 210 brake horsepower engine and nine-speed gearbox. Also showcased was the four-axle CF85 8x4 510 brake horsepower work truck with MX-13 engine, disc brakes, eight-bag air suspension and an excellent unladen weight of 21,000 pounds. Kenworth had a T409 day cab powered by an MX-13 engine and Eaton gearbox; the latest T610 with wider cab; K200, which represents 30 percent of builds in Australia, with King Cab; and T610 with a Cummins 15-liter engine. Offroad Trucks Australia imports and customizes TATRA to fit customer needs. Offroad Trucks Australia imports Czech Republic TATRA work trucks into Australia and provides products for the mining industry as well as on-road operators requiring a more robust chassis matched to a heavy-duty driveline and suspension system. Tosca Industries builds a unique modular system for vans and chassis cabs. The Australian upfitter/bodybuilder industry, which is not as diverse as in the U.S. or Europe, was well represented at Brisbane Truck Show. This sector is mainly focused on the trailer segment, as this is the dominant method of road transport requiring post-production products. Learn more by visiting truckworldtv.co.uk and the TruckWorld TV YouTube channel, or follow Tim on Facebook or Twitter at truckworld_tv. For more global articles and information, visit ntea.com/globalopportunities. NTEA members can also contact Tim directly for consultation.